UD lifelong learning member Doortje Shover (left) produced a short film about playing recorder duets with friend and fellow musician Buna Fletcher, who has Alzheimer’s disease. 10:37 a.m., March 24, 2014--A short film by Newark resident Doortje Shover, a member of the University of Delaware’s Osher Lifelong Learning Institute in Wilmington, is gaining attention for its focus on the role of music in helping Alzheimer’s patients maintain their quality of life. 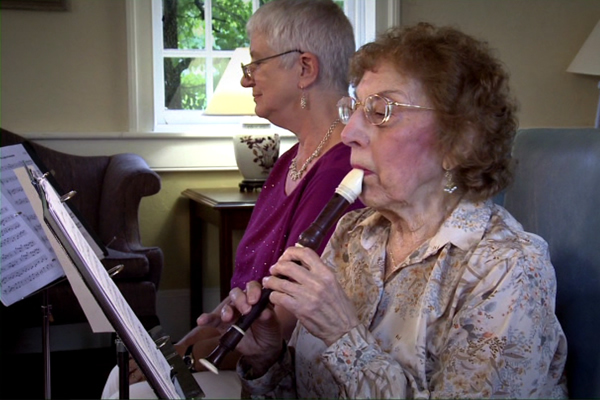 Playing On is Shover’s short documentary about playing the recorder with her friend and fellow musician Buna Fletcher, a former UD lifelong learning member who has Alzheimer’s disease. Their story will be profiled Friday, March 28, on the public television program First, WHYY’s public media newsmagazine for Delaware, at 5:30 and 11 p.m.
Shover and Fletcher met and became friends while playing in recorder ensembles at UD’s Osher Lifelong Learning Institute at Arsht Hall in Wilmington. Both grew up in musical households and shared a love of playing music. Unfortunately, Fletcher’s progressing Alzheimer’s disease gradually affected her ability to participate in the ensembles. She was prone to occasional outbursts and had difficulty getting along in the program. Shover was saddened to see Fletcher leave the group, especially since her friend’s musical ability hadn’t declined in the least. Some time had passed when it occurred to Shover that she might try to play with Fletcher again. Almost on a whim, she bought some new music for recorder duets while visiting family in Holland. Although she wasn’t sure what would happen, a personal hunch led her to hope that Fletcher would be able to pick up her recorder and play as before. Shover’s mother had also suffered from Alzheimer’s disease, and Shover often traveled back to the Netherlands to help with the family’s caregiving efforts. As her mother’s ability to communicate diminished and she would become agitated, Shover said it helped when she would sing with her mother. She hoped that she would also be able to communicate with Fletcher through music. Her hunches were confirmed when she sat down to play with Fletcher in her home. At first, Fletcher was confused, but then she began to play, easily sight-reading the new music Shover had brought. “I put the music in front of her, and she played it beautifully just like she would have before,” said Shover. Shover continued to introduce new pieces on the Fridays when they played together, and Fletcher continued to sight-read and learn the new music, playing as expressively and beautifully as always. Just as significant, Shover noticed that Fletcher appeared happier while she was playing, and often, for the rest of the day as well. Family members and caregivers remarked that Fletcher would have a more positive demeanor and was somewhat more responsive on the days she played. On one particular day when Fletcher and Shover had played together more than usual, Fletcher’s family was astonished when she spontaneously began drawing sketches of family members at dinner. Although an artist all her life, such flashes of creative expression were nearly unheard of since Fletcher’s worsening Alzheimer’s diagnosis. After a few months of playing duets with Fletcher, Shover wanted to share the experience with a wider audience, who she felt could benefit from the message of how music might help us connect with those experiencing cognitive decline. Through fellow UD lifelong learning member and instructor Peggy Brick, she partnered with educational filmmaker Mark Schoen to produce the documentary last year. Family and friends from all around the world helped with critical fundraising. The 10-minute documentary Playing On features Shover and Fletcher's haunting recorder harmonies, as well as conversations with both musicians, and with family and friends of Buna Fletcher. Another highlight is the family photo history tracing Fletcher's musical upbringing. Shover’s film premiered at a UD reception hosted at Goodstay Center in Wilmington last fall, which also featured performances by recorder ensembles from UD’s Osher Lifelong Learning Institute in Wilmington. The documentary will also be screened at the Wilmington Film Festival on April 27. “I feel a great hope from this story, that even if a time comes when we cannot communicate in other ways, that music can be a nonverbal language where we will be able to connect with each other and experience joy,” added Shover. After its initial airing this Friday, the WHYY segment about Fletcher and Shover will appear on the WHYY First website. The Osher Lifelong Learning Institutes at the University of Delaware are membership organizations that provide opportunities for adults 50 and over to learn, teach, and travel with their peers. There are no academic requirements for admission. The only requirements are interest in a continuing educational experience, support of the programs through participation, and a modest membership fee. UD’s Osher Lifelong Learning Institutes are located in Wilmington, Dover and Lewes. More information on all locations is available online.